M&P M2.0 pistol series is the newest star to the M&P pistol line. They are all designed for sports shooting, law enforcement or professional use, or personal defense. These pistols all come with an extended stainless-steel chassis, a low barrel bore axis, a fine-tuned, crisp trigger and an ergonomic grip system. It is available two difference polymer finishes: matte black or M&P’s FDE, “Flat Dark Earth.” Like all other M&P’s, the M&P9 M2.0 4.25 comes with a lifetime warranty and a lifetime service policy. First, the M&P9 M2.0, is chambered in 9mm, so this compact lacks nothing in stopping power (as a note, the 4.25 inch is also available in two other calibers). It also has an accurate 1 in 10-inch twist M&P barrel. The low barrel bore axis of the M&P9 M2.0 4.25-inch make it more comfortable to shoot because of the reduced muzzle rise and allows for faster target acquisition. In the box this pistol comes with two 17-round capacity magazines and comes standard with a steel white dot front sight, and steel two dot rear sights. Ergonomically, it comes with four interchangeable palm swell grip inserts for a tailored shooting experience—small, medium, medium large, and large. Speaking of grip, the M&P9 M2.0 has an aggressive grip texture for secure control. For concealment, look no further—the M&P9 M2.0 is, overall, 7.4 inches long with a 4.25-inch barrel. Therefore, in the right IWB Kydex S&W M&P 9 M2.0 concealed carry holsters, this pistol will disappear. 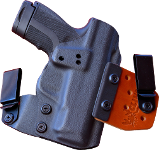 It weighs in at a mere 24.7 ounces, which means in is perfect for all day carry without any discomfort. The sights won’t snag on clothing, and the finish is Armornite to resist any corrosion or cosmetic damage.